The Nova Scotia Department of Natural Resources has done extensive work in the identification and description of forest ecosystems. You may wish to access their extensive classification resource, or download the detailed monograph for white spruce in my particular neck of the woods. One of the most helpful resources I found for differentiating species of spruce can be found in this brief and informative article from Northern Woodlands magazine. 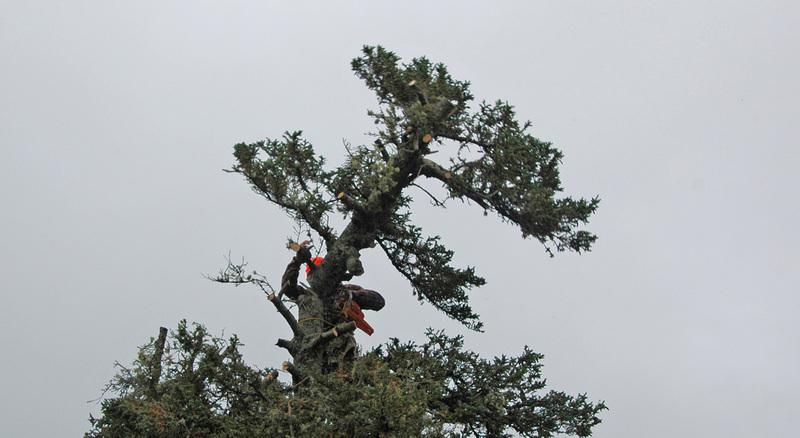 Make no mistake, topping is decidedly not a recommended practice for healthy trees of any kind, conifers included. See for example the resources compiled at Plant Amnesty, including a reprint of a commentary by John Hushagen from Tree Care Industry Magazine. The Washington State Department of Natural Resources has also compiled a variety of educational and promotional resources as part of its “Don’t Top Trees” campaign.